According to my handy app that I use to keep track of Annie’s growth, she is in the 89th percentile for weight, the 94th percentile for height, and the 97th for head size. She gained a little more than a pound in six months, but she grew two and a half inches. She’s losing all that delicious baby chub! It makes me a little sad. Annie really isn’t a baby anymore. My mom subscribes to those emails, “My Toddler This Week” and she loves telling us that Annie is right on target with her behaviors. There are some things I wish she was more advanced in. Like…sleeping through the night (she still wakes up screaming sometimes) or…conflict resolution (yelling at the dog solves nothing). This was our first green chair photoshoot in our new house. She now can climb into the chair herself, and knows how to make it spin and rock. I’d readjust the chair, only to have her start wiggling and moving it around again. Instead of grabbing the blocks, she very carefully made sure they were lined up properly. The lens on my camera also started acting funny about halfway through the shoot, but I didn’t know the extent until after (fuzzy out-of-focus pictures, boo). I think for a belated birthday present Annie needs a new camera lens, don’t you agree, Mike? I went back through her old monthly shots and was unsurprisingly blown away by how much she’s changed. We’re at the point now where these green chair photos will only be taken once a year, on her birthday. She really isn’t a baby anymore (I have to keep reminding myself). She has grown so much. She also gets even cute with every picture you post. What app do you use to track her details? I’d love to have that! It’s called “Total Baby” and keeps track of everything from feedings to diapers to growth. I love it – I used it all the time when she was a newborn. “borderline dreadlocks”..giggle. What a beautiful child she is! I love reading about her adventures and how she is growing! OHH My!!! She REALLY HAS CHANGED!!!! But, no worries….she’ll always be your baby b/c in a Mama’s eyes, that NEVER Changes!!! She is growing into a beautiful little lady. It is just amazing how time flies and you don’t even notice. Loving that grandma gets those emails. How sweet is that? And I love how you took the pics in the same setting every month. Too bad your blog came around long after I had my babies!! I totally would have stolen that. I did monthly pics, but it never occurred to me to use the same stuffed animal or chair in the pics. Duh. That 18 month pic makes me want to reach into the iPad and squeeze her delicious cheeks! My lens just went bonkers, too. My 50mm 1.8 no longer auto focuses (it goes all crazy trying to and then ends with the picture being blurry) and using the manual focus ring on that lens really bites. my 50mm still works, thank goodness! This was my walking around lens…I rented a 24-70, I am afraid I will really like it and have to buy it! Coooool!! How/where do you rent lenses? Great way to check ’em out before taking the plunge!! TELL, TELL!! I love these photos. And you’re right — she looks so different now! She’s turned into such a beautiful little toddler. I admire how you’ve managed to take the green chair photos so consistently. Annie will love looking back at these someday. It’s called “Total Baby.” I downloaded it when she was a newborn! Oh, please take the pix at least every 6 months. You’ll never regret it. I love these photo shoots! I hope you don’t mind but I’ve borrowed your idea for the blocks and photos for my little one. She is 4 months today and I plan on doing my shoot tonight! Beautamous! She has changed, but also looks the same too! She’s so cute. I need the name of that app. My just turned 2 year old is also 30.8 lbs! I love comparison posts, Heather, and this is an awesome one! They are all beautiful, of course, but man, that 12-month old one kills me. What a GORGEOUS kid! my, my how much she’s changed. she’s such a beautiful little girl. you and mike make beautiful babies! She’s already tall enough to ride the Matterhorn! Unfortunately it’s closed until summer. aww, you can do ‘and a half” green chair pictures! they still change so much. She’s beautiful and getting so big. I agree maybe you can do the twice a year green chair pics?! Beautiful, gorgeous, full of life…love her! She is getting so big and grown up. Oh my how they grow up so fast. She is so adorable.!!! I have enjoyed watching her grow the last two years. Happy 24 months Annabel Violet! Dear Heather, that 1 year picture is the BEST. I just love it, love, love, LOVE it! It seems unimaginable to me that Annie is 2. As a stranger that must seem odd. But it just is incredible that it has been nearly three years since my friend led me to Maddis’s page and asked me to pray. I recall vividly that first night, the night she died, sitting in my hotel room (I traveled for work then) reading all the posts before and the agonizing one where your friends shared that the world had lost Maddie. I have read every day since. Truly, other than vacations, I have read every day since. And I guess that is why it seems so impossible that all this time has passed. What is such a special as a fan of the Spohr’s and Annie enters her second year is that I see and feel the genuine joy that has come back into your heart and souls. 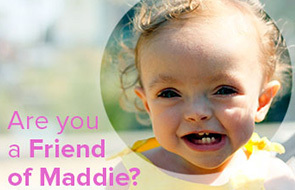 Nothing, no one, can ever fill the deep, deep void Maddie left. But this does not mean you cannot live with happiness and joy. And you do. Because you make a choice to find and accept joy in your lives. And every time you do, you honor Maddie. I hope one day soon we hear about another little Spohr heading this way and we an start the “green chair” count all over again. Until then, may you have joy in abundance. Enjoy your not such a baby, 2 year old curly headed moppet….she is sheer perfection! Melinda! I was thinking the same thing! I started reading this blog at the same time and was devistatedly hooked! I felt so gyped that I only got to know Maddie after she had passed and felt such joy when I learned of Annie’s pending arrival! And, yes, I agree: there is a joy that has returned to Mike and Heather’s eyes. You put it so elegantly that I won’t try to re-say it. Suffice to say: blessed by “knowing” all 4 Spohrs. What app do you use?? I’m always dying to know the percentile for my baby girl… I worry she’s not growing enough. I need a good one!!! Awww 2 years old! I love the recap of her green chair pictures to see how much she has grown. What a cutie! Oh she is such a little punkin!! Thank you for sharing her with us…I’ve been reading since long before she was born and its been FUN watching her grow! She is such a sweet pea! She is so gorgeous! I love this photo series and hope you continue to do these- it’s SUCH a great idea! Always has been a happy baby. Thank you for sharing your wonderful girl with us! She will ALWAYS be your baby! What a sweetheart, and it is amazing to see how she’s changed in such a short time . . . wow. Your Annie reminds me so much of my Nellie. The hair, the facial expressions, the fact that they were born like two days apart. You saying she likes to say “I do it myself!” My Nellie’s favorite phrase is “Nellie do it.” It’s remarkable how much and how quickly these babies change. I myself have had to come to the realization that mine isn’t a baby anymore. Every time she speaks to me in phrases I have to remember that she’s not the same teensy squalling infant I brought home two years ago anymore. Sniff. Happy Birthday to your girl! Such great pictures! We have green chairs that we would take our twins pictures every month too. We can’t get them to sit still now but I still try once a year (they are now 4). Thanks for sharing. Take care. She has changed SOOOOO much! She’s not a baby anymore! That’s such an amazing thing to be able to look back on! If I were you I’d keep taking them every year until she’s 18 even though by the time she’s 13 she’ll probably be rolling her eyes at you and saying, “Mom, this is RIDICULOUS” even she will have to look back on them and smile someday!